Question: Can I expect to just lose the belly or will I gain muscle using this system? Answer: The 3BG principles, exercise, nutrition and mental aspects can all be applied to any goal whether it’s fat loss, muscle building or strength/power training. The focus of the system is geared towards fat loss and losing the belly but the best part is that once you’ve lost the belly you’ll keep it off. How many times have you seen people lose their gut only to gain it right back? The 3BG System will show you how to pack on enough muscle to prevent you from ever gaining the belly back again. Question: Can I do this program if I can’t make it to the gym? Answer: Of course! One of the many components of the 3BG System is the at home workout files. These workouts follow the in gym workouts stride for stride. The subtle differences are seen with the predominant use of dumbbells and an at home pull up bar. Any exercise you will be asked to do in the gym has a suitable at home version or variation. Question: What if I have no gym or previous athletic experience? Answer: The system was built with steady progression in mind and includes a beginner/break in phase. The first 3-6 weeks are used to help familiarize you with the flow of the workouts and to also give your body and nervous system time to adapt to the upcoming phases of the program. Whether you are an ex-jock or a true beginner, there will be videos, pictures and descriptions to help you develop along the way. Question: I’m nervous about online sales and don’t live in North America, is this a problem? Answer: Not at all, online sales and merchant services are actually one of the safest monetary transactions around these days. All of our sales are backed by a 60 day money back guarantee and are all processed through fully secure online subsystems. Question: Is this program useful for females and can my girlfriend or wife follow it? Answer: Yes. Any girl that is looking to slim down her waist and lose fat will benefit from following the nutritional guidelines and exercise plans outlined in the 3BG System. However, there are a few exercises in the 3BG System that if done with enough consistency and intensity will accentuate masculine features such as; a thicker neck, muscular upper back, broader shoulders and torso. For this reason your wife or girlfriend might want to hold off and be on the watch for the highly anticipated launch of The 3BG Fat Loss System 4 Women. 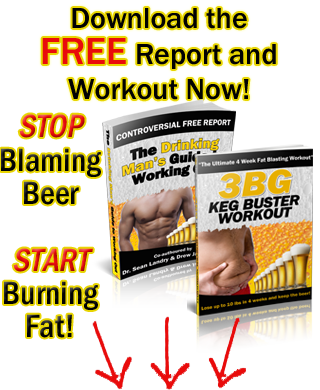 A revolutionary system aimed at helping women deal with the challenges of fat loss and healthy living without having to give up beer. Question: Do I have to follow the nutritional guidelines or can I just use the workout plan? Answer: For optimal results you must follow the nutritional guidelines in the mouth section. If you plan to focus only on the mind and body sections of the 3BG System you will only be 2/3’s or 66% of the way there. This is a three part system where each section is complemented by your compliance to the others. Eat the wrong kinds of foods that wreak havoc on your hormones and you will be stuck in fat storage mode. Without proper nutrition to refuel and repair post workout, muscle building will not occur. Follow the guidelines in the mouth section as best you can to ensure you get back exactly what you put in. Question: I usually skip breakfast, is this OK? Answer: If there is one nutritional concept you should take away from the Mouth section it is the importance of always eating a healthy balanced breakfast. Skipping breakfast regularly is one of the quickest ways to create or retain a beer belly. Giving your body nutrients first thing in the morning will jump start your metabolism for the rest of the day, provided the right foods are chosen. Skipping breakfast and eating 2 meals a day tricks your body into starvation mode where it clings onto any fat because it becomes unsure when the next wave of food is coming. Follow the guidelines outlined in the 3BG System and eat small frequent meals throughout the day to regulate hormone levels and burn fat. Question: What if the 3BG system doesn’t work for me after I buy it? Answer: Then you get every last cent back. Simply send us an email and we’ll refund your money on the spot, no questions asked. We assume all the risk and are confident enough to put our stock in our product and to protect its integrity. Give the 3BG System an honest try and before 60 days if it isn’t right for you, you get your money back. Question: Will I need any special accessories such as lifting belts, straps or gloves for the workouts? Answer: The best accessories we have found over the years are: dip/chin belt (to add weight once you progress past body weight exercise), stopwatch/gymboss timer, chalk and an ab wheel (since most gyms don’t have them). We don’t recommend the use of gloves or straps as they will only diminish your grip strength and stunt forearm growth. Lifting belts are also not suggested since you will halt precious core musculature development. Question: I’m over 40, will I still benefit from this program? Answer: Absolutely, this program has brought success to people anywhere from 18-70. The nutritional guidelines can help strip fat off of anyone if followed consistently and the workouts will build muscle in people of all ages. Question: What if I don’t have a beer belly, could I still benefit from buying this program? Answer: Yes you can! Obviously the target of this program is aimed at losing the belly but as mentioned above the system comes with a nice side effect of helping you build muscle in the process. The muscle gain helps prevent that stubborn beer belly from ever coming back. If you follow the workouts and nutritional guidelines you will build muscle due to the nature and intensity of the workouts. It’s like nothing you have ever done before. Even if you are already fairly lean, expect to take things to the next level! Question: What is an e-book and how do I get access to the 3BG system? Answer: An e-book is a hard or softcover book in an electronic file. They can be read and printed from any computer through either adobe acrobat or foxit reader. Once payment has been received you will be provided with a high speed download link that will transfer every component of the system directly to your computer. You can then store the files, read, view and print them at your discretion. There will be no waiting for shipping and no charges for handling or taxes. Once you make the decision to invest in our system you will be on your way to transforming your body within minutes. Question: Is there a huge list of supplements that I will need to buy? Answer: Absolutely not! We recommend a few staple supplements to help increase convenience and ease but by no means are you required to buy or use ANY supplement to succeed on this program. If you eat the right foods and lift the right weight whether or not you took a supplement along the way will be completely beside the point. No supplement will ever replace hard work or consistency and that’s exactly what our system is designed around. Question: I don’t have a problem following nutritional guidelines during the week but after a night out on the town won’t my alcohol and fast food habits come back to bite me? Answer: If the worst thing you ate all week was a box of chinese take out and a few beers with your friends then it is nothing to worry about. Meals that break the guidelines provide your body and mind with a boost that keeps hormones in check. Say you eat 5 times per day (3 meals 2 snacks), this averages out to 35 meals per week. Having 2-3 meals that break our dietary guidelines represents only 6-8% of your total calories consumed that week. Not much of an issue when you take the big picture into account. However, daily drinking and fast food consumption will drive the 6-8% much higher and will be problematic in the long run, on both your health and your beer belly. Question: I’ve always hated running, especially long distance cardio. Does the 3BG system involve lots of running? Answer: Our program only includes running if you want it to. Steady state cardio is not found in the 3BG System because we are interested in getting you results in the fastest amount of time possible. The system uses high intensity interval training and gives you plenty of options and exercise equipment variations. You never have to be worried about getting bored with cardio ever again. Say goodbye to the hour long jog! Question: How do I know that your product isn’t like all the other gimmicky fat loss programs promising outrageous results? Answer: We give you the truth and are here for you every step of the way. Ask us anything about the 3BG system and we will be there to answer you in a timely manner. Read through the About Team3BG page and decide for yourself whether or not you want to be part of the team. We’re the first to admit that if you follow any workout guideline and commit yourself to health you will succeed. What we did was create the ultimate lifestyle manual to help you; the working man, the father, the beer drinker, everyone outside and in between to get the best results in the shortest amount of time. The 3BG system does not set the individual up for failure but rather enhances your current lifestyle without all the excessive dieting.